Ever wanted to join a club where the mental aspect of the sport rivals the physical side? No wonder fencing is described as "physical chess". You can enhance you reflexes and concentration while also getting quads to rival Chris Hoy! We offer a mix of group lessons, individual lessons and sparring for people of all levels. 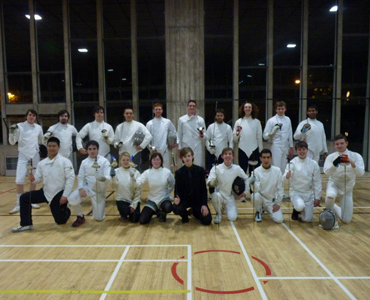 Whether you're a complete novice or a fencing veteran we can accommodate you. We also have two teams in the northern BUCS league with this year being the first year we've introduced a second team due to a large rise in popularity in the last year! Our training sessions Are on our facebook page, find us online and pop in to any session and give it a bash!